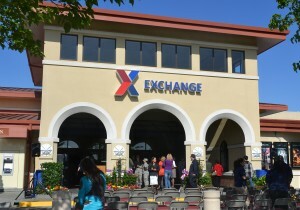 DALLAS – On a beautiful, sun-kissed California morning, military shoppers at Travis AFB welcomed the much anticipated opening of a new Exchange experience. With the May 4 ribbon cutting, the renovated and rebranded Exchange greeted excited shoppers who scooped up TVs, iPads and much more to drive sales up 113 percent over the same day last year. Less than a year after the renovation began, the Exchange boasts fresh new colors, textures and graphics. As with all newly renovated Exchanges, the Travis location features a new layout divided into three major merchandise categories – Home, Life and Style. Shoppers anxious to take advantage of the myriad of great deals that were part of the opening weekend piled in as soon as the ribbon was cut. And based on their reactions, and sales, the store more than met their expectations. The rebranding effort, which is being rolled out to all Exchanges, is designed to provide shoppers with a fresh, updated shopping experience for all the things they need to outfit their unique lifestyle. Combining lively colors and imagery, bold shop design statements, polished floors and a new way to navigate through the store, the concept provides Exchange customers with a best-in-class shopping experience. The branding team now moves on to Fort Bragg for a June 1 christening of the first Army Exchange to receive the new design. The Army & Air Force Exchange Service is a joint command and is directed by a Board of Directors which is responsible to the Secretaries of the Army and the Air Force through the Service Chiefs of Staff. The Exchange has the dual mission of providing authorized patrons with articles of merchandise and services and generating non-appropriated fund earnings as a supplemental source of funding for military morale, welfare and recreation programs. To find out more about the Exchange history and mission or to view recent press releases please visit our Web site at http://www.shopmyexchange.com. This entry was posted on Tuesday, May 15th, 2012 at 15:59	and is filed under Press Release. You can follow any responses to this entry through the RSS 2.0 feed.